Scott Safety, a global leader in innovative personal protective equipment and safety devices, is pleased to introduce the Protégé SG, a versatile new reusable single gas monitor that is configurable to detect 13 different gases. 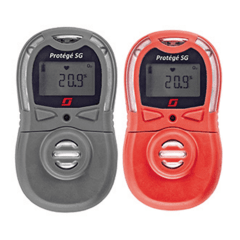 The Protégé SG is a truly universal portable gas detector with advanced features, such as smart plug and play sensors and a replaceable lithium battery that provides unlimited life. The swappable sensors are equipped with a smart sensor board that automatically recognises sensor type and updates the gas label on the LCD display while automatically downloading the necessary calibration parameters. With an IP66/67 rating, global regulatory approvals, multiple languages accessible on the LCD, and internal data logging for up to 5,000 events, the Protégé SG provides industrial workers and first responders maximum flexibility to focus on the task at hand and not on their equipment. The Protégé SG is the first in a new line of cost-effective high performance portable gas monitors being introduced. All Protégé devices will have a similar look, feel and user interface as well as standard features, such as smart plug and play sensors and lithium/alkaline battery options that are interchangeable between monitors. The new Protégé gas detection line will provide customers with global mission critical protective solutions, continuing Scott’s Safety commitment to protect what matters most.